The recent announcement that LabTech Software is managing the the sale of CCleaner for Business licensing and providing free of charge the popular CCleaner for LabTech plugin developed by the Plugins4LabTech team is huge for the LabTech community. Every MSP knows the benefits of using CCleaner to maintain disk space and reduce junk on client PCs but most are unaware of the amazing security tool they have as well. CCleaner a security tool? Absolutely, CCleaner is a great security tool to assist in maintaining password policies across the client and reducing the exposed footprint of the end users. Just have a look at another plugin provided freely by Plugins4LabTech called PassPort. This plugin scans the MSP’s client base for saved password and account info. It pulls this data directly out of the local windows PCs across the MSPs clients and brings all that data back to LabTech. This tool represents just how easy it is to get to this data and if you can get it, anyone can get it. CCleaner for Labtech can help prevent this data from reaching the wrong hands. 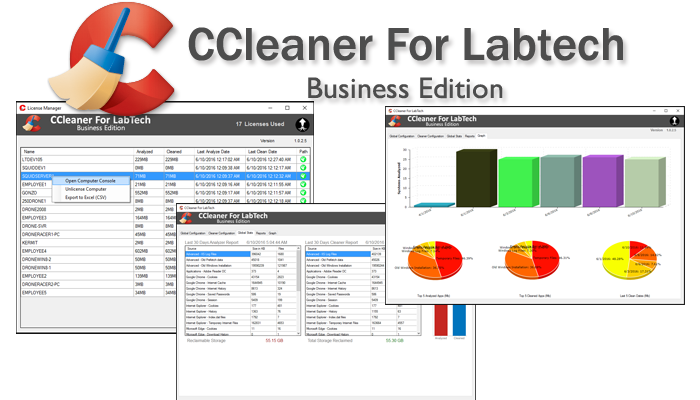 CCleaner for LabTech does this by automating the cleaning process across the entire MSP. By forcing a daily cleaning of all Browser Cache, Saved Passwords and Cookies will reduce the attack surface of each PC and trains the users to be more security minded by prevent them from getting value from saving passwords and allowing tracking and monitoring cookies to follow user’s browsing history. For pennies a month a MSP can plugin to this powerful tool and really provide a value to their clients while helping to keep them safe! For more information on how to get CCleaner for LabTech please reach out to your LabTech Sales team. They will be glad to assist you and get you going with this great tool. Also check out http://www.plugins4labtech.com for a complete list of free plugins for LabTech Software. I am looking for some information on the plug-in for cCleaner. We are trying it out, but it seems to take a really long time for the analyze as well as the clean process to run, and the registry portion is still running. Have tried on many devices with the same result. Am I missing a piece?